For months, popular music store Amie Street has kept a deal it forged with Songza, a media streaming service, under wraps. But this tweet (and a fair amount of research on our part) has uncovered the news: Amie Street acquired Songza back in October 2008, and planned to keep the deal under wraps until they were ready to announce whatever it is they have in store for the product. Amie Street co-founders Elias Roman and Joshua Boltuch confirm that the acquisition definitely took place, and Songza co-founder Scott Robbin has since become part of the 20-headed team based in New York. Songza’s other co-founder, Aza Raskin, had earlier left to join Mozilla. Update: more information about the deal just came in. Songza was acquired for part stock, part cash, and the total sum was in the high six figures to low seven figures. It’s not exactly the best of times to be in the digital music space right now, particularly if you’re a startup trying to build a legitimate business around an ad-supported music streaming service (look at what happened to Ruckus and SpiralFrog), but that’s exactly where Amie Street is planning on taking Songza. Currently, the service is merely an admittedly great-looking front-end for an engine that leverages the YouTube and imeem APIs and lets people intuitively play and share music and generate custom playlists, but Amie Street says it has a much bigger vision for Songza and will release a revamped version of the service by this Summer. Amie Street thinks it can make ad-supported, licensed music streaming work, and there’s no reason to doubt that for now. After all, the company has managed to build a nice, sustainable business with a great conceptual model (where the user community dynamically decides on the pricing of music tracks) and this in partnership with music labels. So why did they buy Songza? Roman tells me the service had long been an affiliate partner for Amie Street, and apart from a decent revenue generator for them, they were impressed with its marketing potential, design, active and committed user base as well as the fact that the small company went out of its way not to stream copyrighted content (which sounds nice, but seems virtually impossible to avoid since it depends on third-party services for locating music). 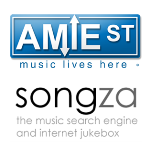 Either way, the company is now a part of Amie Street, and according to Roman and Boltuch the aggregate traffic currently exceeds 1 million uniques on a monthly basis, the bulk of which comes from Songza, since it is completely free and requires no registration for searching and playing music. Here’s another thing I learned during my conversation with Amie Street’s co-founders: the company is currently finalizing a Series B round of funding, which it expects to close pretty soon. They had earlier raised an undisclosed round of investment from Amazon.com.